This is a very good codec — so good that at first, I thought it was lossless. It finally starts to exhibit noticeable artifacts at Low. Pay attention to the building frame in the lower-left. Animation, 32 bits, high quality. Animation, 32 bits, medium quality. Animation, 32 bits, low quality. Now, finally, some artifacts are showing up. Still looks great everywhere else in the frame, though. Animation, 32 bits, least quality. And now it's really noticeable. You can see the defining characteristic of Animation's artifacts: Long horizontal streaks. That's because, as you can tell from Animation's component subtype ('rle '), it's Run-Length Encoding. Bradley Sepos emailed me to tell me that Animation is lossless at its Highest quality setting. Makes sense, being RLE. My best guess is that the loss exhibited by lower quality settings is performed by consolidating similar runs (that is, runs of a similar color) into one larger run. Animation differs from the other codecs (except Cinepak) in that it supports bit-depths other than 32, and 16-bit mode is not bad at all. Here, the artifacts start at Medium. Animation, 16 bits, best quality. Animation, 16 bits, high quality. Animation, 16 bits, medium quality. … and really become obvious at Low and Least. You can even see it in the iShowU bug, where it intersects the xterm. Animation, 16 bits, low quality. Animation, 16 bits, least quality. 8-bit mode has only two quality settings: ≥medium and <medium. Animation, 8 bits, medium quality. Animation, 8 bits, low quality. Apple's QuickTime Compression and Decompression Guide has a description of the Animation codec. MultimediaWiki has technical information about the Animation codec, which it calls “QuickTime RLE”. 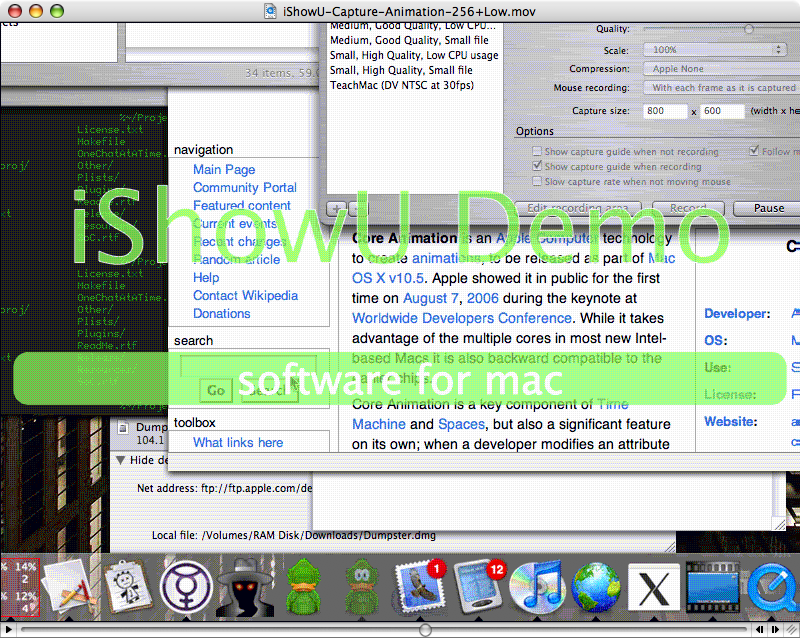 By the way, Animation and Video are among QuickTime's oldest codecs, being present in QuickTime 1.0. That's according to develop #7, which was the introduction of QuickTime.